Review: Apparently this is part of the Northwest series and is the third installment. The book didn’t have a series feel so I looked at the synopsis for the second novel and it didn’t seem to relate whatsoever. This was a disappointment for me. The summary on the back intrigued me and it seemed like it would be a fast paced thriller/mystery… it wasn’t. The summary states a “crazed fan stalked who nearly killed mother” and the book barely dives into that but continues to bring it up. The main character Cassie was not the greatest. She seemed all over the place. The POV changes quite a lot throughout so I felt myself rereading certain parts to see who was “speaking”. I feel there were a lot of unnecessary scenes written in. Or certain scenes just dragged on for far too long. It felt like it took a long time for there to be anything happening in the book. Then out of nowhere something would happen and then it would drag for longer. This author has been praised for writing a number of really good books, but this book gave me a poor first impression and I probably won’t be picking up another one of her books in the future. 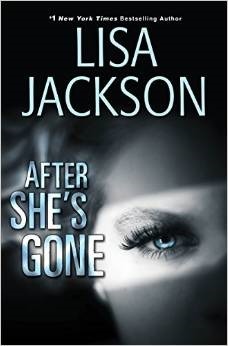 This entry was posted in after shes gone, book, book review, books, lisa Jackson, rating, review. Bookmark the permalink.